Some facts about the UK economy. The Great Moderation. 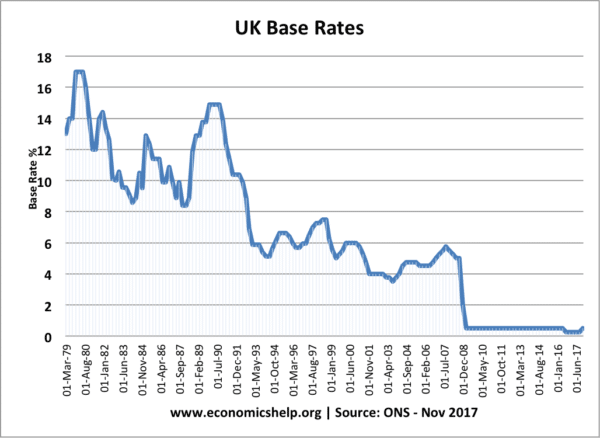 Between 1993 and 2007, the UK experienced 63 consecutive quarters of economic growth – it was the longest unbroken period of economic growth on record. The Great Moderation was followed by the recession of 2008/09, – a steeper decline in GDP than the Great Depression. 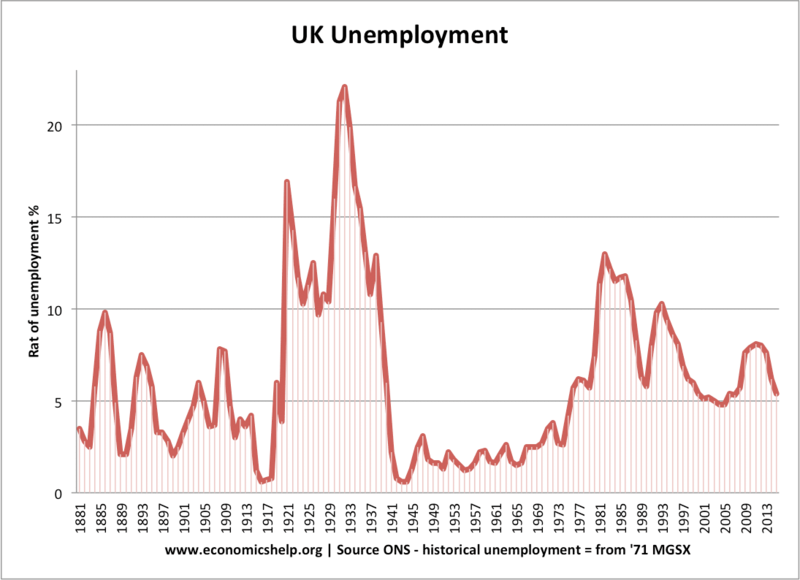 Unemployment in the UK was highest during the Great Depression of the 1930s at over 22% of the workforce. This was also was in a period of minimal welfare support from the government. 53% of UK imports come from the EU. Germany is our biggest import source, followed by Spain. British national debt originated during the reign of William III – when the king asked a few bankers to help buy government debt. In 2018, UK national debt stood at £1,792.3 billion equivalent to 85.2% of GDP. 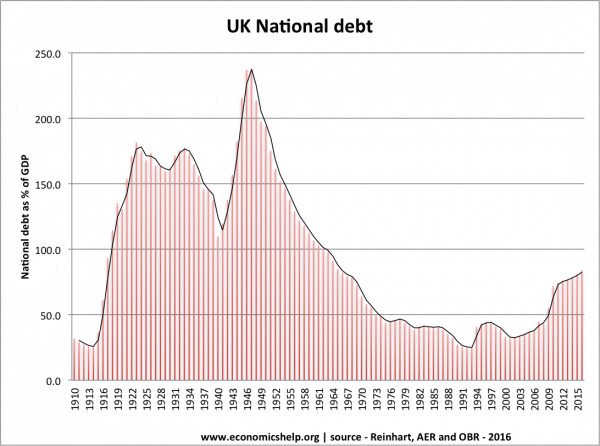 The interest payment on this debt was £68bn or 3.5% of GDP. 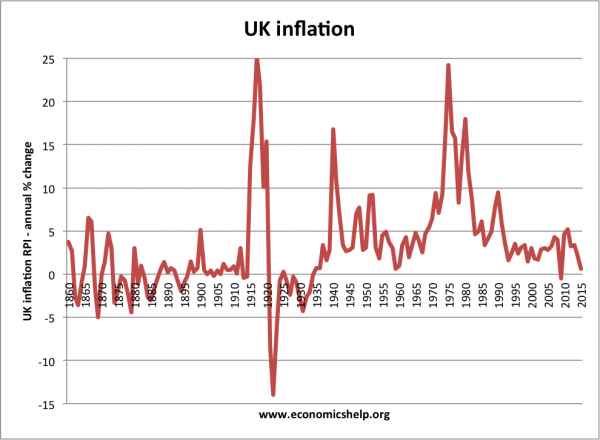 The highest rates of inflation in the post-war period was 25% in 1975. This inflation was due to the oil crisis – rising oil prices and rising wages. In 1909, Liberal chancellor Winston Churchill set up ‘Trade councils‘ for industries with notoriously low pay. These wage councils set wages for these particular industries. These trade councils were superseded by ‘wage councils in 1945. These wage councils were abolished in1993 for 2.5 million low paid workers. Excavators wearing their own “long water boots” 4s. 6d. In 1940 about 33% of household income was spent on food. In 2017, this is about 12%.